Today someone is being married, and they are wearing this necklace. They requested a commission after trolling through my blog, selecting the Necco Wafer style, but in their color way. Fabric samples were sent. The bride is wearing a gorgeous peach satin gown with ecru lace overlay, which this necklace will compliment most appropriately. Congratulations A, and all the best to you in your new lives together! 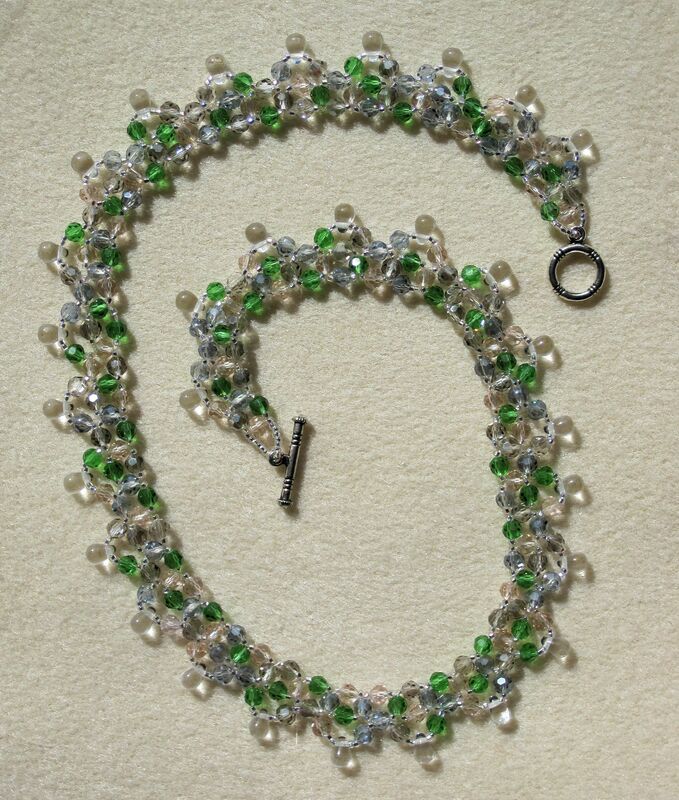 I picked up a mix of faceted glass beads the other day, totally taken with the bright greens that were in there. Of course, once I got them home, there was aqua, smoke and clear crystals as well, but fluorescent lighting is not the best to show these nuances. I mixed in some clear drops, and came up with this necklace. It’s a bit longer than my usual (18 inches less the clasp) but it all works. 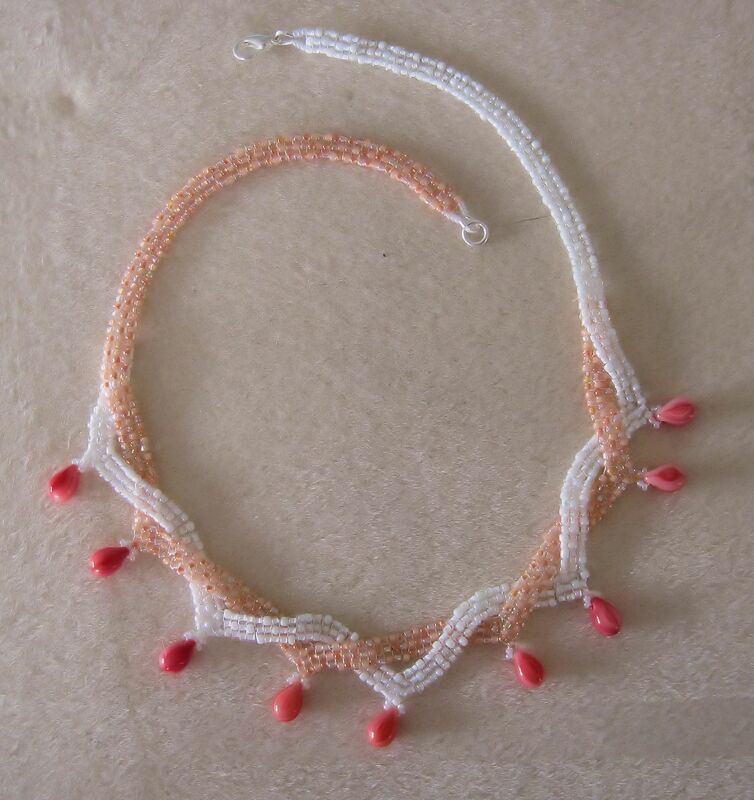 This is the same beading pattern as Josephine, but it looks completely different. Different beads. Different drops. Different colors. 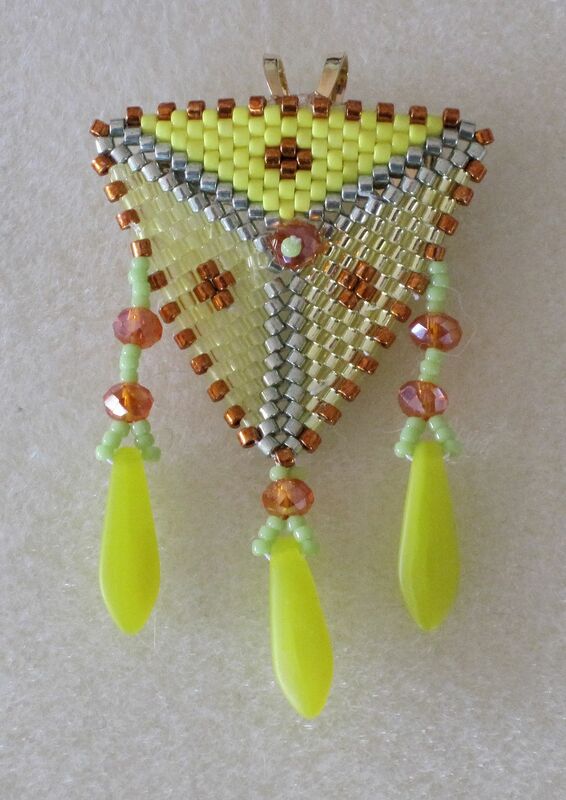 That’s the beauty of beading. Slight, or major changes to one’s materials creates something new and unique each and every time. Shades of lime, pink and purple. Toss in some magenta and blue, and another confection is born! These are part of the same group of buttons as Sour Blueberry and Sweet Hearts. The last of them too. This will probably also be the last button bracelet for a while. I feel I’ve gotten them out of my system. At least for now. 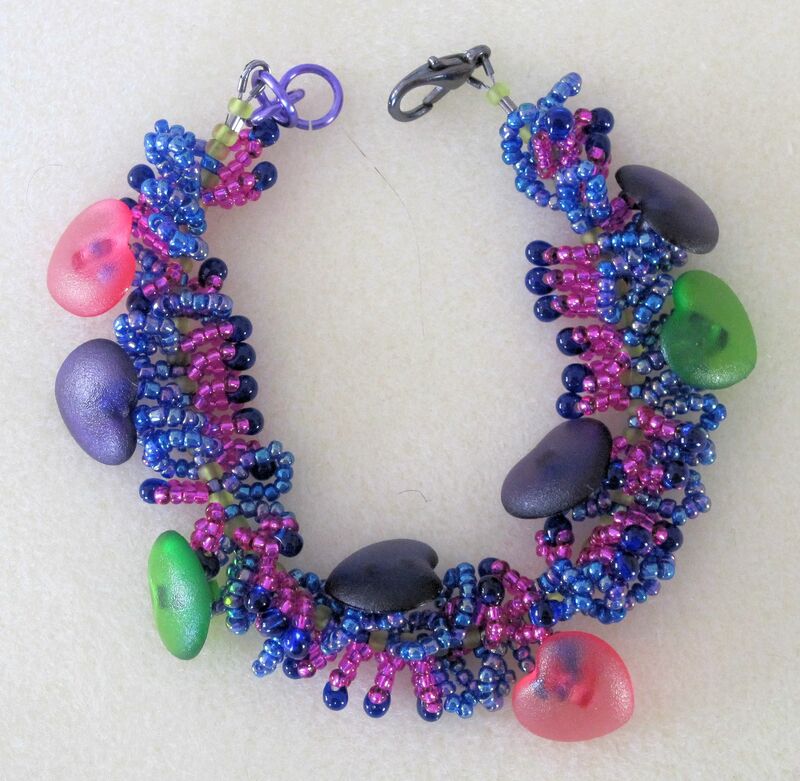 Loops and loops of seed beads in blue. Silver-lined magenta with blue drops and, of course, the buttons. A dark lobster claw clasp hooking into some purple rings. Good enough to eat! I don’t, in general, do much wire working with my jewelry. The odd eye pin or head pin from colored wire, perhaps. Lately though, I’ve felt a need to do something with sturdier tools than a needle and thread. Enter these chain maille bracelets. They’re a lot of fun to wear, having heft and swagger to them. 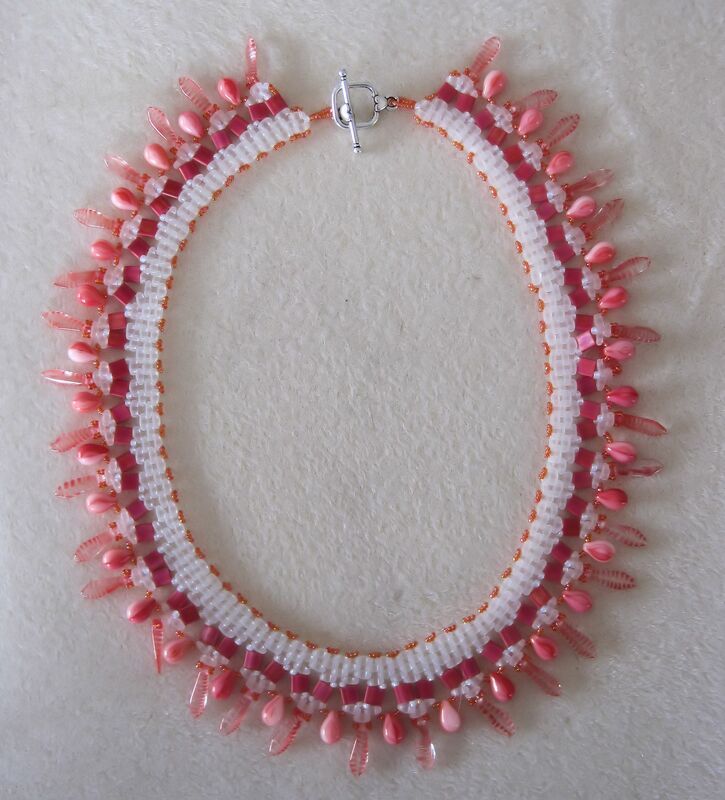 If you’ve read any of the beading blogs or magazines, chain maille has taken off like a storm. There are all sorts of intricate patterns that can be made. Basically, it’s not your SCA re-enactors territory any more! This is my simple dip into that realm. I probably won’t do much more than this. I know, never say never. Anyway, these are made with borosilicate drops (or they could be buttons), each of which is threaded onto a jump ring, then the jump rings closed around each other to form links. Add enough links, and you get a decorated chain. 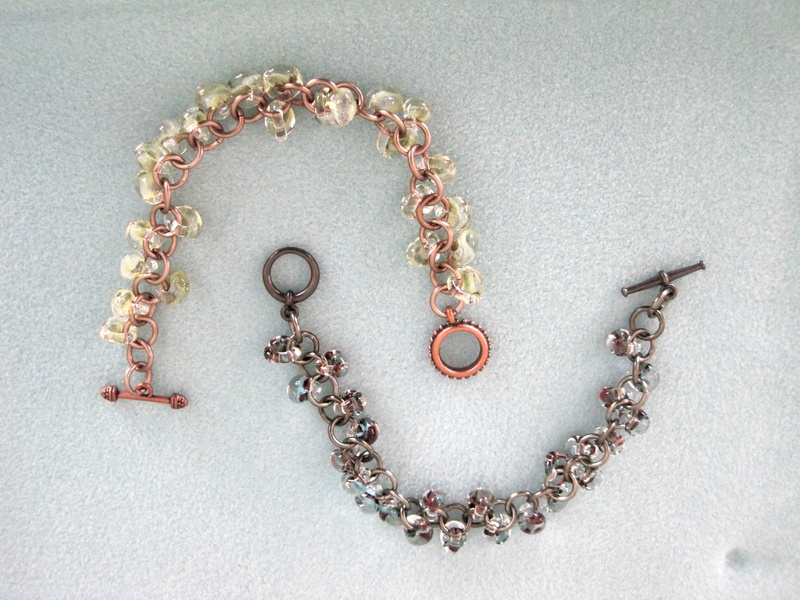 Add a clasp, and you have a bracelet. They’re a lot of fun to make. I enjoyed wielding pliers (one in each hand), making sure each and every ring stayed round, true and closed with a crisp snap.